Risk has always been an integral part of business, but our recent Governance, Risk and Compliance (GRC) benchmark research shows that companies deal with risk with varying degrees of effectiveness – especially operational risk. A majority of companies lag in their overall GRC maturity, as I covered in a recent blog post. Operational risk management should be of greater interest to executives today because they can have greater control of it than before. The expansion of IT systems to automate and support most business processes has made it easier than ever to measure, monitor and report on what’s going on in a company. It’s now practical to expand the scope of operational risk management and improve companies’ effectiveness in handling risk events when they occur. Our benchmark research on business analytics finds that just 13 percent of companies overall and 11 percent of finance departments use predictive analytics. 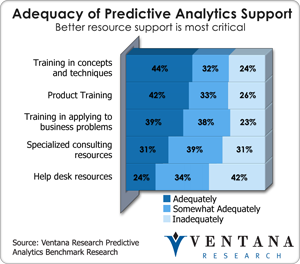 I think advanced analytics – especially predictive analytics – should play a larger role in managing organizations. Making it easier to create and consume advanced analytics would help organizations broaden their integration in business planning and execution. This was one of the points that SPSS, an IBM subsidiary that provides analytics, addressed at IBM’s recent analyst summit. Anyone who focuses on the practical uses of information technology, as I do, must consider the data aspects of adopting any new technology to achieve some business purpose. Reliable data must be readily available in the necessary form and format, or that shiny new IT bauble you want to deploy will fall short of expectations. Our research benchmarks cover a range of core business and IT processes, and they regularly demonstrate that data deficiencies are a root cause of issues organizations have in performing core functions; typically the larger the company, the more severe the data issues become. We started Ventana Research a decade ago, with the objective of providing the highest quality in business-focused information technology research available. We were particularly interested in offering fact-based market research that would focus on the practical needs of getting the most value from technology in business and IT functions. Since then many of the observations we make and much of the advice we offer are grounded in our benchmark research. In a field that often blurs the distinction between fact and opinion, we stress the former. The quality of our research stems from the methodology and the processes we use in benchmarking organizations’ performance. We believe our approach makes our research highly credible and worthy of your attention. A main reason why desktop spreadsheets are pervasive in midsize companies (which we define as those with 100 to 1,000 employees) is that these organizations do not have the financial and manpower resources to implement and maintain traditional enterprise business intelligence and performance management systems. To address this gap in the market, several years ago IBM Cognos launched Express, a business intelligence and planning software package designed specifically for midsize companies as well as independent workgroups within larger corporations. It’s a package designed for easy (and relatively inexpensive) implementation and maintenance, often by channel partners. Ventana Research recently completed benchmark research on governance, risk and compliance (GRC), three business activities that are naturally linked. Although managing them requires separate and sometimes very different processes, on the whole these activities affect each other: Effective corporate governance ensures compliances with laws, regulations and company policies, and without governance, there’s no way to control risk. Separately or considered together, managing governance, risk and compliance is increasingly important.